Wedding Dress photography. When it comes to pre photos details, I am known as the top wedding photographer in Charleston for reasons like this. Capturing a wedding dress gets my creative juices going, because it is so challenging for me to create images that have art to them and are different, and unique. The brides dress is one of them. The possibilities are endless, on the images you can create. Again for me, I like thinking out of the box. For this wedding the bride got ready at Sullivan Island, Sc, at her aunt house witch was beautiful, and while the house had many rooms, and good window light, I opted to ask the bride if I could barrow a couple of her bridesmaid and take the dress outside. 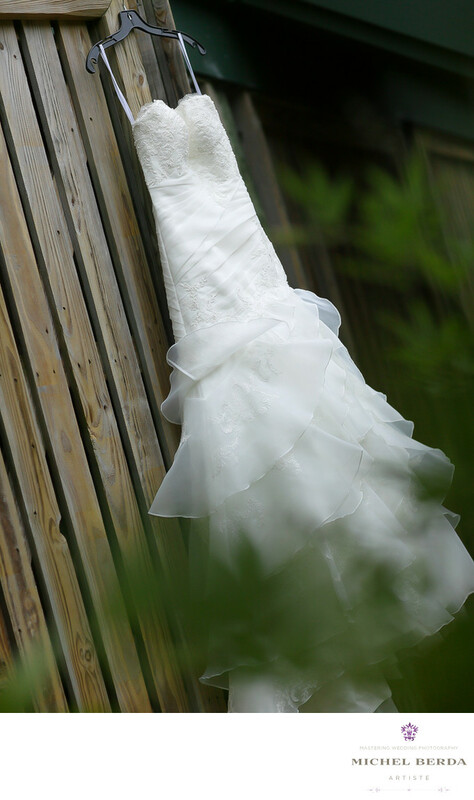 As a wedding photographer in Charleston, South Carolina, I am very familiar with the look and feel that I want to use as a background to accent the bride dress. It took a ladder, two very nice bridesmaids and a great vision, for us to place the dress on the beautiful garage wooden door, and by amazing a great background gave this image a great rustic look. In positioning myself, photographing the dress at a lower angle gave me that vision then in making it more interesting image, by adding the leaves from the trees to the frame that cause the blur and a great green texture. I love this image, so did the bride when she saw the image and said WOW you brought the entire feel and mood of the house including my dress in one image.Keywords: Sullivan Island Charleston Wedding (3).